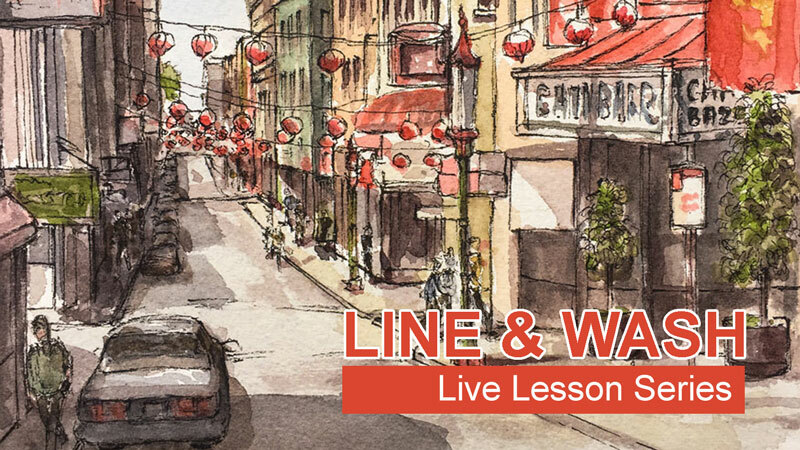 A four-part lesson series on combining pen and ink applications with watercolor washes. The initial sketch is laid out using a modified and quick version of perspective with graphite. Loose pen and ink applications are made over the graphite sketch. A complex scene is simplified by removing elements that would make the image too busy. Watercolor washes are added, exploiting a complementary color scheme. Your composition is too hard. I’ll just watch you. Very thourough demonstration,but I miss the exact content of the coulors.Is that possible? I have just finished learning this lesson 😊 . it’s first time I can do a watercolor painting like this 😊😊 I’m happy to watch my painting for hours but I love your painting more ! Love your lessons, you have a wonderful way of doing things. Your studio is better than that black curtain. Also, love hearing about your family.